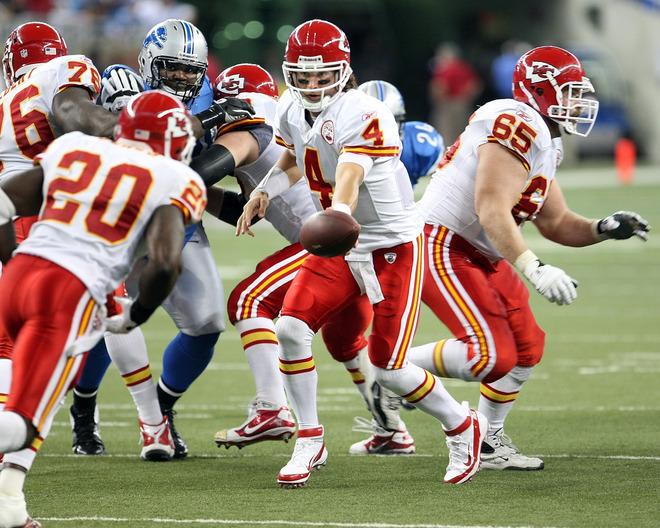 The Kansas City Chiefs were one of the NFL’s breakthrough teams in 2010. So far this season, they’ve done nothing but break down. After being on the losing end of a pair of lopsided outcomes to begin the 2011 campaign, the crumbling Chiefs visit a venue where they’ve been often dealt a similar fate in recent years in Sunday’s game against the San Diego Chargers from Qualcomm Stadium. This Week 3 matchup features two teams that have combined to win the last five AFC West championship, with Kansas City shattering the Chargers’ four-year stranglehold on the division by coming through with a surprising 10-6 record in 2010 that followed three straight last-place finishes. A repeat performance doesn’t appear to be in the cards, however, after the Chiefs dropped their first two outings of this campaign in a most ignominious fashion. An embarrassing 41-7 setback to longtime also-ran Buffalo began Kansas City’s early free-fall, and the club was even less competitive in a 48-3 shellacking by upstart Detroit last Sunday that tied for the worst margin of defeat in franchise history. Making matters worse, the Chiefs have been ravaged by a rash of season-ending ACL tears to three cornerstone players. The latest — and possibly most damaging — one occurred against the Lions, when All-Pro running back Jamaal Charles went down in the first quarter. Charles, the runner-up for last year’s NFL rushing title after bursting out for a career-best 1,467 yards while averaging a lethal 6.4 yards per carry, joins young standout safety Eric Berry and valued tight end Tony Moeaki on the injured reserve list. Berry suffered his calamity in the Week 1 disaster against the Bills, while Moeaki’s came in the team’s preseason finale. History suggests it may actually get worse before it gets better for Kansas City. The Chiefs have lost at Qualcomm Stadium in each of the past three years and were outscored by a 74-14 margin in the last two appearances, including a 31-0 beatdown in December in which the team mustered an anemic 67 total yards and five first downs. The offense hasn’t been a whole lot better over the course of this season. In addition to having scored a league-low 10 points, Kansas City also ranks last in passing yards (221) and 30th in total yards (240.0 ypg). Quarterback Matt Cassel, who did not play in last December’s blowout in San Diego due to an appendectomy, has produced a subpar 50.4 passer rating through the first two weeks and threw three interceptions against the Lions. The Chargers, notorious for undergoing slow starts under head coach Norv Turner, having exactly been flying out of the gates either. The Bolts were able to overcome a 10-point halftime deficit in a 24-17 home win over Minnesota in Week 1, but were plagued by mistakes in last Sunday’s 35-21 loss at powerhouse New England. San Diego turned the ball over four times against the Patriots and own a minus-five takeaway-to-giveaway ratio on the season. The Chiefs are a league- worst minus-seven in that category, having coughed it up a troubling nine times in two games. A return home could very well get the Chargers back on track. The team is 12-2 over its regular-season tests at Qualcomm Stadium, while scoring 31 points or more in six of those last seven triumphs. Kansas City holds a slight 51-49-1 edge in a regular-season series with San Diego that dates back to the teams’ AFL days in 1960, when the Chiefs franchise was then known as the Dallas Texans and the Chargers resided in Los Angeles. San Diego has won six of the last seven bouts between the longtime foes, having registered home-and-home sweeps in both 2008 and 2009 in addition to last December’s shutout and a 24-10 road decision in 2007. Kansas City’s lone positive result over that stretch occurred last season, a 21-14 Monday night verdict at Arrowhead Stadium in Week 1. In addition to their regular-season history, the teams have met once in the postseason, with the Chargers scoring a 17-0 home win over the Chiefs in a 1992 AFC First-Round Playoff. Turner owns a 6-7 lifetime record against the Chiefs as a head coach, but has won six of eight tests with Kansas City since taking over in San Diego in 2007. Kansas City’s Todd Haley is 1-3 against both Turner and the Chargers during his time with the Chiefs. The loss of Charles, unquestionably Kansas City’s best playmaker, is a devastating blow to an offense that’s extremely reliant on running the football. The Chiefs will try to get by using a combination of declining veteran Thomas Jones (43 rushing yards) and the diminutive Dexter McCluster (93 rushing yards, 9 receptions), a running back in college who spent most of his rookie season of 2010 as a slot receiver. The 170-pound speedster is slight but very quick, and he’s averaged an encouraging 7.8 yards per carry in spot duty this year. Fullback Le’Ron McClain, a 900-yard rusher with Baltimore in 2008, could find his way into the mix as well. McCluster figures to be utilized quite a bit as a receiver out of the backfield as well, especially with Kansas City still in search of a consistent secondary target alongside 2010 All-Pro wideout Dwayne Bowe (7 receptions), the NFL’s leader with 15 touchdown receptions last season. The team signed former 1,000-yard receiver Steve Breaston (3 receptions) in the offseason with the hopes of him being that guy, but the ex-Cardinal has yet to get untracked. Cassel (252 passing yards, 1 TD, 4 INT) has been an early disappointment as well, displaying a reluctance to take shots downfield and turning the ball over at an increased rate compared to his career year of 2010. The struggling quarterback threw just five interceptions heading into last year’s regular-season finale, but has nine in four games (including the playoffs) since. San Diego’s defense couldn’t have delivered any more disparate results over the first two weeks. After limiting Minnesota’s sputtering aerial attack to a paltry 28 passing yards and 187 total in the opener, the unit was torched for 410 yards by Tom Brady and New England’s prolific offense last Sunday and gave up a combined 504 in the loss. Fortunately for coordinator Greg Manusky, the Chiefs don’t pose anywhere near that sort of threat, so the Chargers will likely concentrate more on containing the run on Sunday. They haven’t been particularly good in that area, however, having allowed unimpressive averages of 5.0 yards per carry and 126.5 rushing yards per game (26th overall) and enabling the Vikings’ Adrian Peterson to rip off 98 yards on 16 attempts in Week 1. The team does have a very good interior anchor in nose tackle Antonio Garay (10 tackles, 1 sack), though, while brittle strong safety Bob Sanders (12 tackles) was one of the game’s elite run-stopping safeties in Indianapolis before a host of injuries reduced his effectiveness. A pass rush that was able to get to Brady twice last week is headed up by outside linebacker Shaun Phillips (7 tackles, 1 sack, 1 INT), who’s coming off an 11-sack season in 2010, and veteran offseason addition Travis LaBoy (5 tackles). The Chargers can light up the scoreboard, especially on their home turf, when all their parts are in place and clicking. Led by three-time Pro Bowl selection and 4,000-yard passer Philip Rivers (713 passing yards, 4 TD, 4 INT), San Diego comes into the contest ranked third in total offense (438.5 ypg) and fourth in yards via the air (351.0 ypg), and have converted a league- high 64 percent of third-down opportunities. The team stands only 17th in scoring (22.5 ypg), however, with turnovers — including Rivers’ uncharacteristic four interceptions in the early going — looming as the main culprit. The fiery quarterback also may not have a couple of his key weapons on hand on Sunday, with big-bodied wide receiver Malcom Floyd (5 receptions) likely out after straining his groin against the Patriots and perennial All- Pro tight end Antonio Gates (8 receptions) a huge question mark due to a recurring plantar fasciitis problem with his foot. Rivers will still be able to look in the direction of big-play wideout Vincent Jackson (12 receptions, 203 yards, 2 TD), who torched New England’s secondary for career bests of 10 catches and 172 yards and scored two touchdowns, while burly running back Mike Tolbert (45 rushing yards, 3 total TD) currently tops the league with 17 receptions totaling 131 yards. He’s hobbled with a sore calf at the moment, meaning backfield mate Ryan Mathews (109 rushing yards, 1 TD, 10 receptions) — a capable receiver as well — could play a more prominent role on Sunday. Veteran wideout Patrick Crayton (ankle) is expected to return from a two-game absence this week, which will help offset Floyd’s probable unavailability. Kansas City has had its problems on the defensive end as well, having permitted an NFL-worst 89 points and generating a league-low one sack in its two tilts. The Chiefs were gashed for 163 rushing yards by Buffalo in the opener, then yielded 322 net passing yards and four Matthew Stafford touchdown strikes in last week’s debacle against the Lions. Even with Berry’s crippling injury, there’s more talent here than those lousy numbers suggest, however. Outside linebacker Tamba Hali (12 tackles, 1 sack) is a premier pass rusher who led the AFC with 14 1/2 sacks a year ago, fellow former first-round pick Derrick Johnson (9 tackles, 3 PD) is a quality all-around player on the inside and fourth-year pros Brandon Flowers (7 tackles, 1 INT, 5 PD) and Brandon Carr (7 tackles) form a solid young cornerback combo. Kansas City does need to find someone other than Hali who can consistently pressure the quarterback, however, especially in a matchup against a San Diego team that’s very proficient at throwing the ball. Turnovers. Realistically, the only way the Chargers should lose this game is by beating themselves, but based on the team’s history in September under Turner, it isn’t entirely out of the question if San Diego is as careless with the football as it was against the Patriots. Of course, the Chiefs have been even more error-prone than their opponent, having given the ball away a damaging nine times in two games. Though the Chargers won’t be playing with their full complement of receivers on Sunday, Rivers is still well-equipped to do plenty of damage with his right arm if Kansas City can’t mount at least a semblance of a pass rush. If he’s got all day to survey the field, the Chiefs will be in big trouble. Special teams. With the Chiefs badly undermanned here, it’s an absolute must they take full advantage of the few areas they may have an edge on the Chargers. This could be one of them, as San Diego’s coverage units were historically horrendous in 2010 and the Chargers allowed a kickoff return touchdown on their first play of this campaign. Kansas City won last year’s season-opening clash between these teams in part due to McCluster taking back a punt 94 yards for a score. The Chiefs have been woefully inept in nearly every phase over the first two weeks and are decimated by injuries as well, not to mention they’ve really struggled as the visitor in this series in recent history. Though San Diego has yet to hit its stride, a common theme for the team in the early stages of years past, the Chargers should find the perfect remedy for their inconsistent play in a Kansas City squad that has far greater problems at the moment.